The algorithm used by the Stream to Feature tool is designed primarily for vectorization of stream networks or any other raster representing a raster linear network for which directionality is known. The tool is optimized to use a direction raster to aid in vectorizing intersecting and adjacent cells. It is possible for two adjacent linear features of the same value to be vectorized as two parallel lines. This is in contrast to the Raster To Polyline tool, which is generally more aggressive with collapsing the lines together. 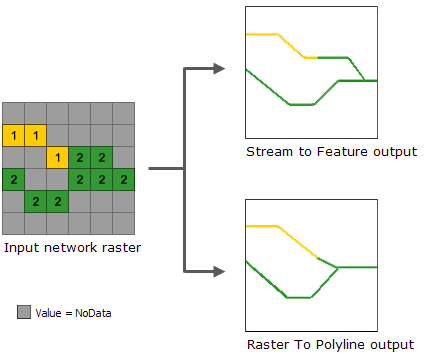 To visualize this difference, an input stream network is shown below, with the simulated Stream to Feature output compared to the Raster To Polyline output. Tarboton, D. G., R. L. Bras, and I. Rodriguez-Iturbe. 1991. On the Extraction of Channel Networks from Digital Elevation Data. Hydrological Processes. 5: 81–100.